I love photography that has a soul, a heart, and a life. This post is an example of why I try not to study typical wedding photography very often and I try not to blog an overabundance of the “typical wedding shot” or a trendy look that will date the approach. I also try to keep my blog simple, often blogging one or two moments from each wedding. I see happy people smiling, kissing, hugging, crying and celebrating every day with many emotions. What really does it for me is an approach that shows a lot in one photograph and is very much a part of every day life. It’s why I try to show moments within moments – mostly staying away from “camera aware” photography. We show a lot of emotion and it’s very easy for a photographer to capture emotion with a telephoto lens, zoomed in to this or that. The real challenge comes when a photographer can get close and stay out of the way, allowing the wedding party to keep doing what they are doing, operating as normal. This allows the photographer to show many pieces, or layers, of a scene. I use a wide angle lens quite frequently (not too wide, but a good journalistic wide lens) because it can give us the life we are after, not just subjects. To do so is a challenge and it allows us to offer something unique, something that will never happen again, and something that will show a life. Our latest Veritas wedding featured the bride, mother of the bride, and bridesmaids all getting ready at Veritas Winery before the wedding began. It happens at every wedding but the differences in documentation vary widely. This moment incorporates a number of important pieces to the brides day, all in one photograph. First of all, it shows quite a few of the people involved with the wedding – the bride getting help with her necklace, the mother of the bride, and two bridesmaids. 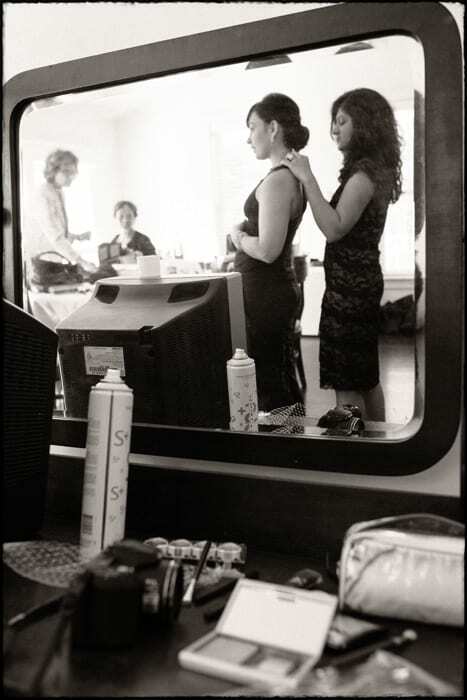 You see the action of what is occurring, and you see details of a typical pre-wedding ritual of hairspray, make-up, a camera, a purse, and a part of the veil. It’s a part of what goes on at a wedding every day and a wonderful piece of the story. I have been a fan of the intimacy leading up to the wedding – it’s so real and certainly an important part of documentary wedding day photography. I love that everyone is involved in this photograph and that no one is camera aware. That, coupled with quite a few important “getting ready” details and a framed reflection of the day in a rustic mirror made this image one of my favorites. It contains a little bit of everything that one would try to show during this part of the day.